WOBURN, MA--(Marketwire - August 4, 2008) - Kaspersky Lab, a leading provider of Internet security solutions that protect against all forms of viruses, spyware, rookits, hacker attacks and spam, today announced the North American release of Kaspersky Internet Security 2009 and Kaspersky Anti-Virus 2009, bringing to market a new standard in anti-malware protection. With an exponential increase in malicious threats and the unprecedented sophistication of cybercriminal activities, industry experts have challenged the anti-malware industry to find new approaches to protecting individual computer users. Customers have spoken up, too. They want effective and automated protection against today's threats from a solution that doesn't slow their computers down. This new generation of Kaspersky security software is designed to address these challenges. Kaspersky has entirely rebuilt its award-winning anti-malware security engine. Now, Kaspersky Internet Security 2009 and Kaspersky Anti-Virus 2009 sport both powerful detection and unrivaled scanning speeds. Unlike traditional anti-virus technology that simply looks for information that is considered bad and monitors all other activity, Kaspersky goes far beyond malware detection and monitoring. Kaspersky Internet Security 2009 is the first consumer PC security protection of its kind. The software combines traditional signature scanning of bad applications (blacklisting) with an extensive database of more than 400 million known, good applications (whitelisting). By eliminating the software code that are known to be bad, and determining which ones are good, Kaspersky Internet Security 2009 can focus its extensive analysis capabilities to closely watch and restrict that which falls into neither category (good or bad), but can pose potential harm at any time. The combination of new technology and a revolutionary approach to protection provides greater security, significantly frees processor and memory resources, and virtually eliminates the need for users to respond to bothersome pop-ups, which add up to a much safer and better computing experience. "In two short years, Kaspersky has taken the crowded U.S. consumer market by storm. The Company is known for its high-level of protection delivered in its Internet security and stand-alone anti-virus products. The 2009 versions do not fall short. With the layered approach of protection, including whitelisting and vulnerability analysis, Kaspersky Internet Security 2009 is the first product to combine these technologies into one solution, thus providing full protection for the consumer." "Kaspersky Lab became one of the leaders in scan optimization 3 years ago with technology that eliminated the need to scan files that were known to be good, and automatically provided system resources back to the user based on their application activities. Its latest releases not only continue to support requirements for gaming, and social networking, but significantly improve overall performance." "Customers are demanding anti-malware products that provide better protection, better performance, and include the ability to make more decisions on the user's behalf. Kaspersky's 2009 security products meet those needs while establishing a new standard in Internet security. This next generation provides the most comprehensive and essential protection available to individual PC users, all while improving their computing experience." Kaspersky Internet Security 2009 and Kaspersky Anti-Virus 2009 are engineered for speed and are packed with a first-of-its-kind arsenal of tools to help to protect computer users from the rapid growth of malicious cybercrime attacks. -- UPDATED Anti-Malware Engine: The Kaspersky 2009 anti-malware engine has been re-engineered, rendering scanning speed improvements of 300% at initial scan and 700% during subsequent scans (when compared to previous versions). System boot-up time has been reduced in excess of 35%, making it one of the fastest scanning engines on the market. -- NEW Vulnerability Assessment: The Kaspersky Security Analyzer, based on vulnerability intelligence technology from Secunia, scans the computer for vulnerabilities, including patch updates and configurations for many common applications. As vulnerabilities are discovered, Kaspersky 2009 directs its users to detailed information about the vulnerability and how to fix it. -- NEW Collective Intelligence Gathering: The Kaspersky Security Network is an opt-in feature that enables users to automatically send previously unseen information to Kaspersky Lab for evalution and potential inclusion on either the Kaspersky blacklist or whitelist. This allows Kaspersky Lab to react faster to emerging threats and add new entries to the list of known "good" applications. -- Automated Standard Hourly Updates: By default, Kaspersky 2009 selects the best server, checks for signature updates, and automatically downloads and installs new updates hourly, or at a user-specified schedule. NEW Application Activity Filtering: Uses multiple methods to determine the trustworthiness of software installed on a user's computer. -- Applications are automatically categorization based on signature detection (blacklisting) and a constantly updated database of known good applications (whitelisting) derived from data in Bit9's 6.5 billion record "Global Software Registry." -- Unknown applications are subject to a thorough set of tests in a secure virtual environment, which emulates queries to system resources and processes. -- Advanced heuristic analysis is used to assess the security of the unknown applications and processes, and a Security Rating is given to each process. -- Once an application has been assigned a security rating (such as high restricted or low restricted), it is treated accordingly with pre-defined or user-established rules. These rules may allow, limit, or block access to the computer's resources such as hard disks, the Internet, other software applications, or the Windows registry. -- Ongoing defense measures leverage a sophisticated Host-based Intrusion Prevention System (HIPS) and an integrated bi-directional firewall which constantly monitor the behavior of all applications and processes. Together with highly advanced heuristic rules, Kaspersky's proactive protection is always on guard for instant detection, evaluation and blocking of hidden malware that can come to life on protected systems, even before the signatures in the anti-virus database are updated. In total, this represents a significant departure from the traditional anti-malware detection. -- NEW Anti-Phishing Virtual Keyboard: Warns users and blocks access to phishing sites. A screen-based virtual keyboard prevents keyloggers from intercepting keystrokes and sending online banking PIN numbers or other confidential data to criminals. -- ENHANCED Parental Controls: Improved Parental Controls allow parents to restrict access to the Internet based on the suitability of the content. Internet access can be time-limited, sites can be added to the whitelist or blacklist and site visits can be logged or blocked. Kaspersky Lab offer free technical support around-the-clock to help users with its products and to resolve any technical issues they may experience. This includes support via phone, e-mail, live chat and a comprehensive knowledge base. Free telephone support is available from Kaspersky's U.S.-based team of experts from 8 am-9 pm ET, Monday-Friday. 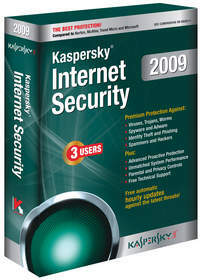 Kaspersky Internet Security 2009 and Kaspersky Anti-Virus 2009 can be purchased online at http://usa.kaspersky.com/newstandard/ as of August 4th, 2008, and at popular retail outlets in the United States and Canada beginning in mid-August. Customers may upgrade free of charge from version 6.0 (or later) to version 2009, for the remainder of their existing license period. Further information about Kaspersky's 2009 security products, and step-by-step instructions on how to upgrade can be found at: http://usa.kaspersky.com/support/upgrade.php. Kaspersky Lab delivers a new standard for protection against IT security threats, including viruses, spyware, crimeware, hackers and spam for home users, SMBs, large enterprises and the mobile computing environment. In addition to Kaspersky's own products, the company's technology is an important anti-malware component inside the products and services of more than 100 of the industry's leading IT security solution providers. Learn more at www.kaspersky.com. For the latest on antivirus, anti-spyware, anti-spam and other IT security issues and trends, visit www.viruslist.com.